Heathrow have the names and locations of the 18 shortlisted sites that remain in the running to help deliver the expanded airport, signalling the project has reached a new and significant milestone on its path to delivery. The sites have been selected from a longlist of 65, all of which were visited during a nationwide tour which concluded in the summer of 2018. The longlisted locations were then all invited to take part in a pre-qualification questionnaire which helped to determine which sites were best placed to be involved in the delivery of Britain’s largest infrastructure project. In the autumn, the 18 sites shortlisted will now have the opportunity to pitch for their chance to become one of the final four construction centres, to be announced early next year, ahead of work starting in 2021. In addition to the economic opportunities, the Logistics Hubs will bring to the whole of the UK, Heathrow’s ongoing Business Summit series will also provide small businesses throughout the country the opportunity to become part of Heathrow’s supply chain ahead of expansion. The 11 summits are spread throughout various regions and nations across the country, giving hundreds of SMEs access to one-on-one appointments with Heathrow’s top suppliers. Commenting, Emma Gilthorpe, Heathrow’s Executive Director for Expansion said: “Our expansion plans are progressing apace and continue to be refined thanks to feedback from a wide range of stakeholders. Heathrow is as committed as ever to creating a plan that delivers for every corner of the UK. Logistics hubs are key to achieving that. This innovative approach will be more cost effective, efficient and sustainable, helping to unlock much needed capacity quickly and responsibly. 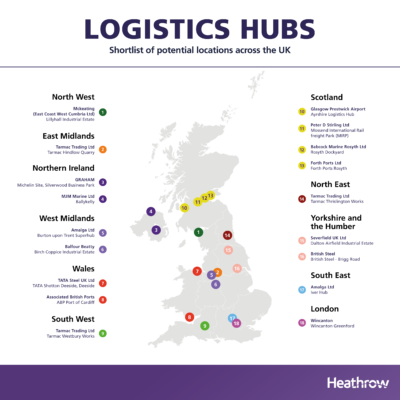 Business Minister Lord Henley said: “Heathrow’s announcement today moves their vision for UK-wide Logistics Hubs a step closer to being realised.